Encoders are used to determine the position, velocity and direction of a motor shaft or other mechanical motion. They provide information required for the precise control of a variety of applications, such as positioning a rotary table, pick and place, machine assembly, packaging, robotics and more. Regardless of type, all encoders provide a method of orientation detection that’s used as a reference point for position control. An encoder (for industrial controls) is a special sensor that captures position information and relays that data to other devices. The position information can be determined using one of three technologies: optical, magnetic or capacitive. built in to prevent contamination from dust, vibration and other conditions common to industrial environments. 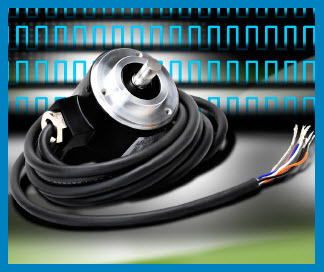 Magnetic encoders are more rugged than optical encoders and often used in environments in which dirt, steam, vibration and other factors could interfere with optical encoder performance. Magnetic encoders cannot achieve the resolution or accuracy of optical encoders. Capacitive encoders are relative newcomers as an industrial sensing technology. These encoders are as rugged as magnetic encoders but also do not achieve the high resolutions of optical encoders. For more download the free white paper. In business since 1994, AutomationDirect is a distributor offering thousands of industrial automation products for electrical control systems, including PLCs, operator interfaces, AC drives, motors, stepper systems, sensors, motor control, enclosures and more. Their prices are typically well below the list price of more traditional automation companies because of their model and focus on efficiency and the majority of their products are stocked for same-day shipping. Plus, get free two-day delivery on orders over $49; some limitations apply. For more information, contact them at 800-633-0405 or visit www.automationdirect.com/encoders.